As predicted by Skymet Weather, heavy to extremely heavy rains occurred over many parts of Maharashtra. The intensity of rains was much more over Vidarbha and Marathwada wherein most pockets recorded rainfall in three-digits. In fact, Marathwada received these intense showers after elongated dry days. On the other hand, rains over Konkan and Madhya Maharashtra varied between light to moderate with isolated heavy in pockets. 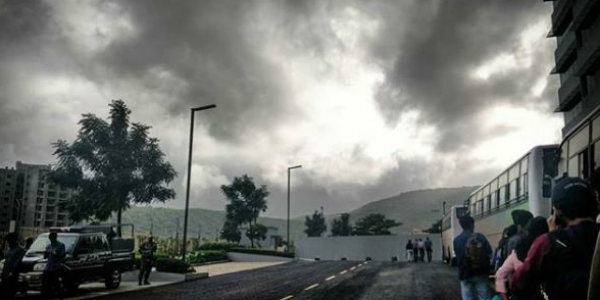 In the last 24 hours, from 08:30 am on Thursday, Yeotmal recorded 176 mm of heavy rains, Mahabaleshwar 163 mm, Aurangabad 157 mm, Akola 153 mm, Buldhana 130 mm, Jalna 130 mm, Jalgaon 126 mm, Washim 110 mm, Nanded 102 mm, Parbhani 78 mm, Ahmadnagar 58 mm, Malegaon 58 mm, Vengurla 41 mm, Nashik 33 mm, Bramhapuri 24 mm, Dahanu 17 mm, Mumbai 11 mm, Ratnagiri 9 mm, Pune 8 mm, and Kolhapur recorded 6 mm of rains. It was due to these incessant Monsoon rains that all the four meteorological divisions of the state are now experiencing normal or surplus rainfall. As on August 16, Konkan division is rain surplus 7%. Meanwhile, rains over Vidarbha, Madhya Maharashtra and Marathwada are -4%, -2% and -18% respectively below the normal. The reason for these rains was the westward movement of Depression towards Vidarbha and adjoining area. At present, this weather system lies over southwest Madhya Pradesh, adjoining Gujarat and Madhya Maharashtra. It would gradually move further west and would weaken in a well-marked low-pressure area in the next 24 hours. Now rains would reduce over Vidarbha and Marathwada, but we expect moderate to heavy rains to still continue over parts of North Madhya Maharashtra and Konkan region. However, the intensity would be more over the northern half of Konkan for another 24 hours. Mumbai may also receive moderate rains with one or two heavy spells until today. The rain intensity would reduce from tomorrow onwards. Farmers of North Madhya Maharashtra and Konkan region are advised to apply second dose of fertilizers to rice after ensuring the field is free from weed and drain the excess water from field. Regular supervision of the rice field should be carried out for any incidence of pests or diseases. The stone grafting programme in the mango nursery should be continued.